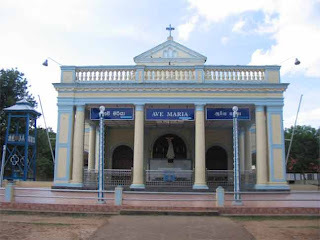 Over 400,000 devotees are expected to visit to the Shrine of Our Lady of Madhu in Mannar to attend its annual feast. The Uthuru Vasanthaya task force in collaboration with the security forces and police has made elaborate arrangements to provide all facilities needed to cater to the pilgrims visiting the Madhu shrine to attend the annual feast, said Administrator of the Madhu church Rev. Fr. Desmond Kulas. "Now all obstacles have been cleared, roads rehabilitated and the church well spruced up to ensure a grand and peaceful feast this year", he said. The 12 km access road to the shrine which was in a dilapidated state is now being rehabilitated for the feast. The Government has also allocated Rs. 2 million to rehabilitate and refurbish the Madhu Post Office.